Have you optimized your online contents to increase website traffic? Sure, you worked hard to write detailed articles. You did your research or wrote from personal experience. You adopted the AP-style of writing. You divided it into easy to follow steps. You ran spell check. You included appropriate photos or illustrations. You included links to relevant resources. You gave it a great title. But, if you want to get the most for your effort, you need to optimize it to get traffic to your site! Cover all the bases. Your well written content needs help to be found. You can't just put it out there with hopes that the magic of the "interweb" will take care of the rest. But, what else is there to do? Were you thorough enough to add Tips and Warnings, add the best keywords and submit your website address and Sitemap to the major Search engines? No? * The desire to get the most out of it. 1. Start off with a good cover photo or illustration, if you want to get someone's attention. Adding photos & illustrations to your steps will help keep that attention. But, if you cannot take the photos or draw the illustrations yourself, where do you find them? Many websites offer millions of free clip art images to chose from. However, you may need to resize them to conform to recommended maximum size; for example 424 pixels x 282 pixels. Although a squared image of 282 x 282 pixels shows better without clicking to enlarge. Increasing a file to a much larger size than original will cause it to appear blurry and out of focus. Save your images in either JPEG, PNG or GIF format, for best viewing quality. Save them with a file name using appropriate keywords, and use the name as the image caption. Keywording images enable search spiders to indexed them as well. Google Images indexes content this way. These images backlink to their original location (your online content). 2. Remove "To Be" verbs, considered as passive/weak writing. Use an online tool such as the one found at aztekera.com/tools/tobeverbs.php. The goal, having 20% or less per step. When replacing these passive verbs, take care to use words and punctuation which allow for continuity and flow. Read the text to yourself and listen to it. Does it sound good and make sense? 3. Start each step with an action verb. An action verb DOES something. Start, stop, add, remove, open, close, search, try, learn, et cetera. Writing in this manner makes defining page content easier for search bots; improving SEO. 4. Include Keywords. As part of the publishing process, you should include at least three relevant keywords. Keywords & keyword phrase usage in the title and body of your article determines how the adbots understand the content when it comes to assigning Advertisement. Your content needs focus. You cannot expect the adbots to guess your intent with your content all over the map. If you need assistance with keywords or key phrases, use Google Adwords Keyword tool. You can copy/paste your selection and have the tool filter them for relevance and offer alternatives. You could insert the address of a similar article and filter it for keywords and key phrases to use in your own. Using words with high competition insures that when one advertiser's budget runs out another one will take its' place. A high search volume indicates popularity. You may find that the highest CPC valued words often have the lowest competition. Mix them up for best overall results. 5. Add resources. If your article references a particular location, type of art or music, piece of equipment, favorite product or material you can include website links to help your readers follow up on it. If you have written other articles on same topic or in the same category, this is where you want to link to them. Again, all of these helpful things increase the overall value of your article. There is nothing wrong adding resources, although you do not want readers navigating away from your content. 6. Include Tips & Warnings. Adding Tips & Warnings not only make your information more useful to readers, they add value to your article. List accurate information here, as garbage could prove detrimental to the credibility of your article. 7. Submit your website/content address to Google, Yahoo and Bing search engines. Submit your Sitemap too! You could simply publish your article and wait for it to get picked up by the search engines, or you can take the initiative and submit it yourself. The big three offer free search engine submission. Eliminate the wait and take control of your own success! But, don't overdo it by repeated submissions. They are often viewed as spam and can cause the search engines to blacklist your submitted website address for a period of time. 8. 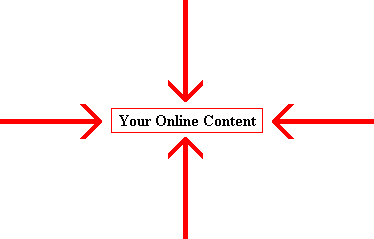 Create backlinks to your content. Backlinks or 'Inbound links,' defined simply as links to your content or website from someplace else. Do you have a website, another profile page on a social networking site such as MySpace, Facebook, LinkedIn, YouTube or Yuku? Do you have an account with Blogger, Twitter or Digg? If you answer questions on Yahoo Answers, for example, place an appropriate link to an applicable article. All excellent places for backlinks! The more you have, the better! Backlinks mean more traffic and greater possibility for residual income! While backlinks from websites with a high page rank carry more weight, all legitimate backlinks are valuable! Submit them to search engines, just as you would submit your new site pages. This analysis includes things such as titles & headers, links & images and search engine friendliness. You also have the ability to check out your site’s web presence, find out which sites redirect to your home page or internal pages, see when the major search engines last crawled your site and which pages they have indexed. You can also purchase an SEO report of your site. 10. Switch to a responsive theme, to make your site more user-friendly to visitors using smartphones and tablets. Websites with responsive themes auto-adjust to different screen sizes and make your content easier to see. 11. Enable HTTPS/SSL protocol. Securing your website with HTTPS/SSL shows visitors that the connection is encrypted and onsite transactions are safe from prying eyes. Doing so even when you do not sell products directly from your site shows that your site can be trusted as legitimate. * After enabling HTTPS/SSL, submit your site as a "new property." HTTP and HTTPS are viewed as separate entities and do not automatically translate. * Even after following all of these steps to optimize your articles, you probably won't see any great results for the first few weeks. It takes a little while for your online content to be crawled and indexed. * Don't forget to submit your back link addresses to the Search Engines. That is, the location of your backlink. Search engine spiders crawl and index links from other sites and pages. This positively affects your page rank. * Little things like adding Bookmarking and Sharing services (AddThis or ShareThis) and a Favicon to your site really matter! * Do not submit your articles or websites addresses to the same search engines more than once per Month. Doing so will likely cause the address to be ignored! * Do not select unrelated keywords just because they are popular. This is "keyword spamming" and will actually hurt your rankings.